A flexible and reliable Web/mobile application for keeping track of your physical assets at home or the office. Perfect for personal or business asset tracking. Replace spreadsheets and expensive scanners with this user-friendly inventory management software. Choose the flavour that suits your asset tracking needs. A single-user, free forever flavour with many useful features and thousands of downloads actively used by individuals from around the world. Also a single-user flavour with all FREE features plus more, including full integrations with Google DriveTM, DropboxTM and Microsoft OneDriveTM. A multi-user, cloud-based flavour with all PREMIUM features plus more. Easily access your data securely from any location, on any device. With envelope budgeting, you group your monthly expenses into separate categories, like groceries, child care, transports, rent, social fund, and so on. You then put cash from your monthly income for the categories in separate envelopes from which you start spending. You stop spending from an envelope once (or before) it is empty. 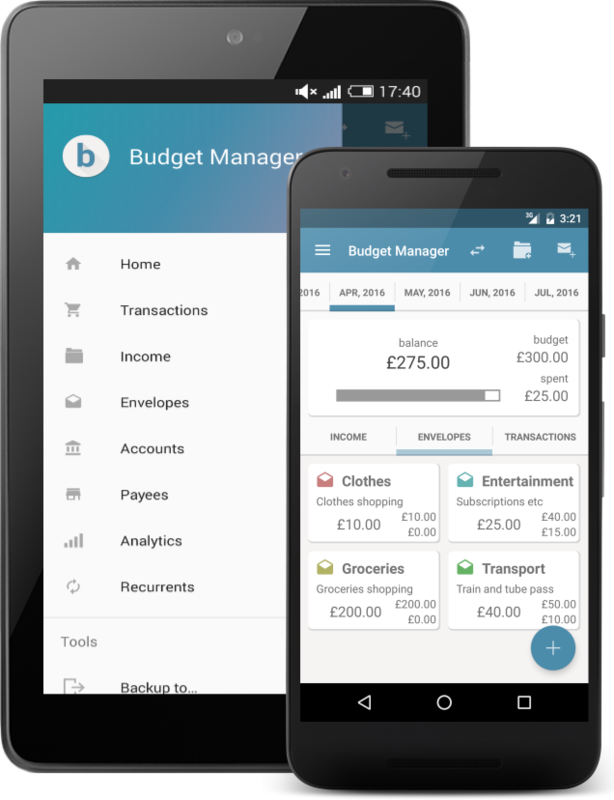 Let Budget Manager help you get your finances under control. Enjoy great Web and mobile news apps cleverly bringing Africa's latest and breaking news to your fingertips. "Simple, easy to use, and it just works." "Home Inventory management. Excellent, flexible, well designed, finally an app that's a pleasure to use." "Excellent and flexible, it adapts to many circumstances..."
"Incredible software, very straight forward...delivers right off the bat. I'm surprised it doesn't cost 10x more. Thank you developer!" "It's amazing. This is the best app ever for getting an estimated value of your property and assets..."
"This app is actually making my job faster and more accurate, I'm extremely pleased with it..."
"Exemplary work! You are the best. Just what I needed. Simple and elegant..."
"After adding a few items to the program, I am pleased with the purchase! The ability to record photos of items in addition to recording bar codes makes it invaluable to me." "The app is indeed great." "Seems to work well on basic test. Has all the features that I need so I shall be buying the paid version." "We are a small construction company. We needed to track more than 1500 electric and hand tools in several locations. It works great! " "I am quite impressed with your high level of customer support." "Fantastic! Does everything I could want and a cheap price too. Well done." "Perfect, almost... Changing my review. Rated it only 2 stars. But this app is almost a 10 star app. It's just about perfect... I've been looking for something like this for a year..."
"Great application. This application is great for the price! Works as advertised." "Use it for field assets for fire industry. Great update, allowed me to add my company logo and business details and licencing for legal purposes." "This is the best app I've purchased. And I'm fussy. Does everything I need and more. Worth every penny." "Just great. We were looking for a simple, reliable, multi-line inventory solution (combining bars and qr-codes), we tried some others and none suited like this one. In addition, the support team kindly helped us with some questions related to Google Drive backup, rapidly answering our e-mails and even checking our datasheets. Good people." "I really like this app, coz it met my need and expectation..."
"This app is great. Makes budgeting so simple and effective. Just put in the transaction (10 second process) each time you make a transaction and you'll know where you stand on your budget." "It's a winner! It's a serious upgrade from my last budgeting app." "Love this app. I have both Asset Manager & Budget Manager and I love both of them." "Brilliant at keeping spending in check. This app is simple and easy to use. Great for keeping all your household budgets on track." "Best 'envelope' budget app I've used yet. Been using it for a few weeks now and it's perfect. Does exactly what I need." "The perfect simple digital version of envelope budgeting. It doesn't have all the bells and whistles of the paid apps, but it does the job and does it well...Recommend it." "Almost perfect! After trying so many options finally I found an app that solves the problem. ;)"
"Great app to stay abreast of Nigerian news. Kudos to you guys." "I like it. It works like magic."